The Williams Martini team would complete their second day of testing at the Barcelona circuit. Again both Sergey Sirotkin and Lance Stroll would share the driving. 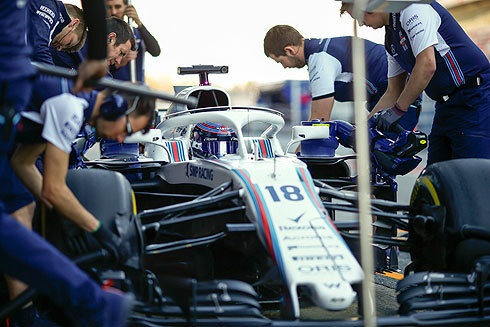 Both drivers would suffer minor issues which would limit their track time but despite this it was still a productive day for the Williams team. The team had worked through soft tyre runs as well as runs with high fuel and a race simulation for Sergey. 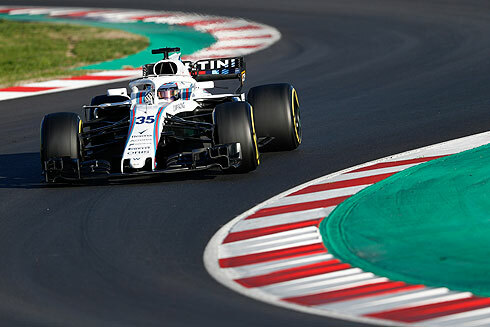 The second day of the Williams Martini teams test at the Barcelona circuit would see Lance Stroll running in the morning session. After two installation laps Lance would return to his pit running on the medium tyre. His next run would see him on the soft tyre but his first lap time was a 1m:31.835 lowering it to a 1m:29.271. He would pit after a short run having completed just eight laps so far. Quickest so far was a time of 1m:19.067 set on the soft tyre. But this would come down even further with a 1m:18.945. As the session continued Lance was still in his pit after nearly two hours completed. Lance would finally return the track running on soft tyres. Hew would improve his times getting down to a 1m:21.831 followed by a 1m:21.688 to still be slowest. He would again improve with a 1m:21.369 to be just two tenths behind ninth. His next lap would see him again improve with a 1m:21.168 to move off the bottom of the times. A 1m:21.155 was an improvement but still he was near the bottom of the times. Lance would pit having now completed twenty nine laps. Quickest time at this point was a 1m:18.752 set using the supersoft tyre. This would see Lance 2.3 seconds off the quickest time. Lance would return for another run getting down to a 1m:20.900 which was still 2.2 seconds off the quickest time. But in testing the usual dilemma is the lack of any sort of direct comparison. Lance would continue to lap the circuit on what appeared to be a long high fuel run. He would improve with a 1m:20.349. After completing sixty three laps Lance would bring his morning running to an end. In the afternoon it would be Sergey Sirotkin who would be running and his first run in the car would see him set a 1m:24.161 after a series of laps running on the soft tyre. He would continue on a long run on the soft tyre. Sergey would have one moment in the session that would see his mechanics having to push him back into his pit. But with the end of the session Sergey would finish with a time of 1m:22.350 having completed eighty laps included in which was a race simulation. During this run he would use the hypersoft tyre. 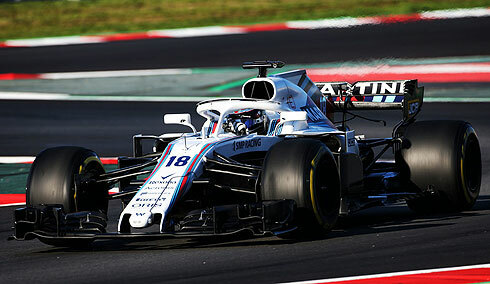 All up the Williams team would complete one hundred and forty laps which would have been more if not for the lost time in the morning and afternoon. Paddy Lowe, Chief Technical Officer: We had the best weather so far of this pre-season testing period with clear skies, and it was relatively warm without significant wind. We had a bit of a slow start with a small issue on the car which unfortunately took an hour to understand, but then Lance achieved a very good set of runs, running sets of new soft's doing performance tests, and that took us to lunchtime. We managed a lot of work very quickly at lunchtime to get out just after two o’clock with Sergey doing extensive work on soft tyres at high fuel. The afternoon was interrupted by an electrical issue which again, lost us about an hour, but we continued that work into a race simulation, including the hypersoft tyre as we did yesterday. We ended the day with the FIA restart sequence tests. We managed a very decent lap count although it would have been far higher if we hadn’t lost an hour in the morning and an hour in the afternoon. Lance Stroll: There is not an awful lot to say about today except, like yesterday, it has been another good day. I was just in the car this morning, got plenty of running and felt good in the car. We have certainly made another step, so now it is just a matter of continuing that good rhythm and seeing where we are at the end of the week. Sergey Sirotkin: We had a good day in total, despite a couple of small issues. We covered a lot of laps during the afternoon, including my first race simulation, so that felt good. We boxed for a small problem but we managed to sort it quite quickly, so overall, I think we can be happy with how today went. The FW41 returns to the track tomorrow with Robert driving in the morning session, before handing over to Lance in the afternoon.